After four years of production, the fabulous Nissan GT-R receives an update for 2011 that should improve its already impressive capabilities even further. 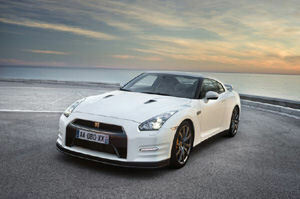 In the US, the facelifted GT-R will be sold from model year 2012 on. The Nissan GT-R was first introduced to the Japanese market as an all-new vehicle in 2007 and entered the US and other world markets in 2009. Five trims are available: A new "Black Edition" with unique seat trim, interior colors and wheels joins the lineup (¥ 9,303,000). Available in Japan and other countries are a "Club Track" edition prepared for circuit use-only, the "Pure Edition" (¥ 8,694,000) , "Premium Edition " (¥ 9,450,000) and the performance-oriented "SpecV" trim (¥ 15,750,000). Premium Edition: The Nissan GT-R Premium comes fully equipped with a navigation system, custom-designed 11-speaker Bose audio system, premium near-black finish wheels, and heated front seats. Black Edition: The Black Edition features special lightweight metallic black aluminum-alloy forged RAYS wheels, a unique red and black interior with Recaro leather-appointed seats and a dark headliner. SpecV: The SpecV is the performance trim of the Nissan GT-R lineup. In correspondence with this intention, the SpecV features an overboost function that increases engine output to 632 Nm at 3,600 to 5,600 rpm. For improved abrasion resistance and stability in racing circuit driving, rear brake pad material is changed and VDC (Vehicle Dynamic Control) balance under braking modified. The SpecV also features RAYS lightweight aluminum forged wheels in Metallic Black. Club Track: The Club Track edition, developed exclusively for racing circuit use, allows drivers to experience the full performance potential of the Nissan GT-R. Special parts for racing circuit driving are installed by the Authorised Servicefactory Association, which is also in charge of the distribution. A wide range of events and activities for Club Track edition owners will be held as well, including one-on-one competition training sessions given by professional drivers and special races organized mainly by the Nissan GT-R Authorised Servicefactory Association. For information on exterior and interior layout and equipment, as well as information about engine and suspension setup and modifications, please check the following pages.